Through the Save Energy Now (SEN) initiative, the Department of Energy’s (DOE’s) Industrial Technologies Program (ITP) helps industrial plants save both energy and money by conducting energy assessments using DOE software tools and technical information to determine how to reduce energy use in key industrial processes. The energy assessments conducted by the DOE’s energy experts help manufacturing facilities of all sizes and in locations across the United States identify immediate opportunities to save energy and increase profitability. These assessments focus primarily on energy-intensive systems, including process heating, steam, pumps, fans, and compressed air. 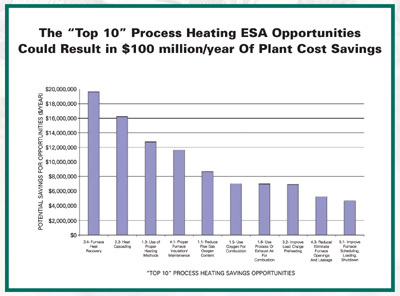 Insulation systems have proven to be one of the top 10 steam and process heating assessment opportunities that can result in huge dollar savings per year for participating facilities (see Figures 1 and 2). 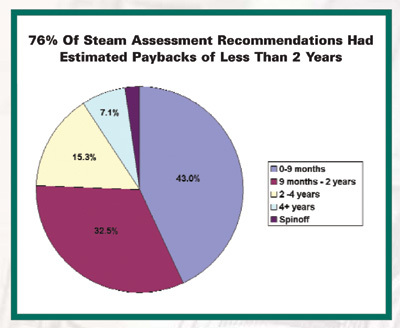 Plus, 76 percent of steam assessment and 73 percent of process heating assessment recommendations had estimated paybacks of less than 2 years (see Figures 3 and 4). The majority of the 2006 assessments were performed in the Eastern and Southern United States. (See Figure 5 for a detailed map.) 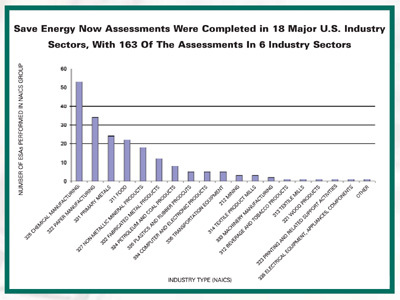 SEN assessments were completed in 18 major U.S. industry sectors, with 163 of the assessments in six industry sectors (see Figure 6). Energy savings projects worth $30 million per year were immediately implemented. Energy savings projects worth $98 million per year are in the process of being implemented. Energy savings projects worth $179 million per year are either being planned or are under review. Total savings of $81 million per year were obtained from implemented energy-saving projects. An additional savings of $70 million per year were expected from energy-saving projects that are under way. Projects that are scheduled to occur are expected to result in an additional $180 million per year in energy savings. 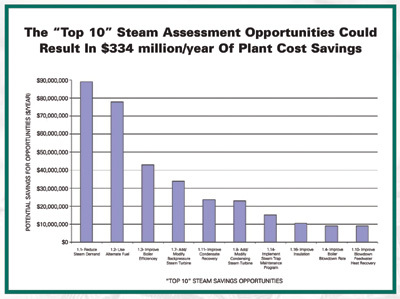 From 3-day assessments, the average recommended savings have been about 10 percent of plant energy use. The majority of identified savings opportunities have paybacks of less than 2 years. The 6- and 12-month follow-up implementation results have been encouraging. Large industries and states continue to be enthusiastic about the SEN program and its efforts to help facilities save both energy and money. 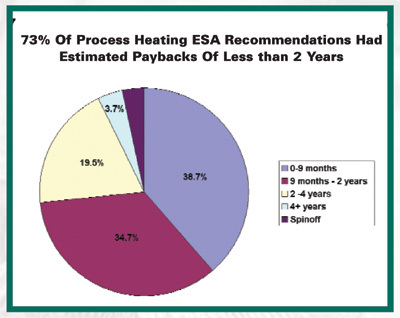 To view the full report from the 2006 SEN assessments, please go online and visit www.eere.energy.gov/industry/saveenergynow/partners/results.cfm. For additional information about the SEN program, please visit www.eere.energy.gov/industry/saveenergynow.